This page is a text version of the Forest to Field History Book Volume Two. You can purchase a PDF copy of the book in our online store. The PDF copy is an exact page by page representation of the original book. This text version has been reformated for the web and contains text recognition mistakes. These mistakes do not appear in the purchased version. The purchased version also includes each image in the original book. Much has happened in the lives of Clare and Alice since 1984. Sherri Lee married Kick Burgess in 1992. They live in Minnedosa with their three sons: Glen Everett, and twins, Dana Lee and Dustin James. Sherri became a Radiological Technologist and is head of the X-ray Department at the Brandon Clinic. Rick owns Burgess Quality Foods in Minnedosa. Leslie Jo-Ann married Harvey Rintoul in 1988. They live in Portage with their two children, Jonathan Harvey and Erin Christina. Leslie is employed as a receptionist and Harvey is employed at the Manitoba Developmental Centre. Senior Unit Leader with Partylite Candles. Many week­ ends are spent at their cottage at Ditch Lake. Lachlan (Lanny) William graduated from the Erickson Collegiate and attended the Brandon University where he obtained a BA degree. He and his fiance, Janean Morran, live in Winnipeg where he has an internship at the Manitoba Legislature and Janean is employed in sales at the Holiday Inn. Alice moved into Erickson in 1990 and remained teaching at Onanole and Erickson. She will retire in June 2000. The Erickson Lutheran Church is an important part of her life. She sings in the choir, serves on the Parish Council Board and is an active E.L.W. member. She played an instrumental part in planning the Year 2000 Homecoming. She especially enjoys keeping up to the activities of her grandchildren. 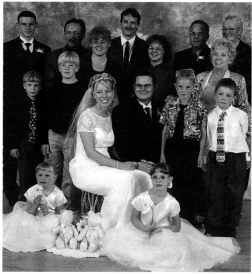 Editor S Note:: Lanny and Janean were married III Grandview, MB on September 2, 2000. Following his internship, Lanny secured employment at the Manitoba Legislature. Janean is employed by the Nurses Union in Winnipeg. After retirement, Alice moved west of On an ole, where she is enjoying country living. 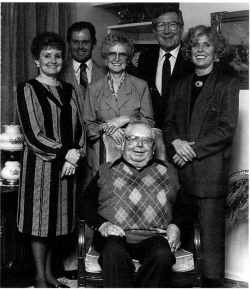 At the time of the publishing of ~ 10 .Ei.cl.d.. Ed and Eileen were retired and living in Erickson. Ed passed away October 30, 1992 after a stay in Erickson Hospital.